Recently, I went to a small community bank to open a checking account. I drove away from Washington and entered a branch of a small bank. It’s a transaction I easily could have made from home — over the phone or online — but I wanted to experience firsthand what consumers across the country experience when they visit a community bank. Community banks are characterized by their relationship-based practices. And my visit was no exception. I was greeted with a smile and an offer of candy. While the patient branch manager went through the requisite paperwork to open my account, a customer walked in with his three-year-old daughter. Mary ran up to the teller to give her a hug. The father said that, as they drove by, Mary insisted on stopping by the bank to say “hi.” The bank manager smiled and told me, “She has been coming here since she was born.” It felt like I just entered a Norman Rockwell painting. Small banks like these are slowly disappearing from America’s landscape. Today, 627 counties are only served by community banking offices, 122 counties have only one banking office, and 33 counties have no banking offices at all. The banking landscape in the United States has changed dramatically in the last few decades. 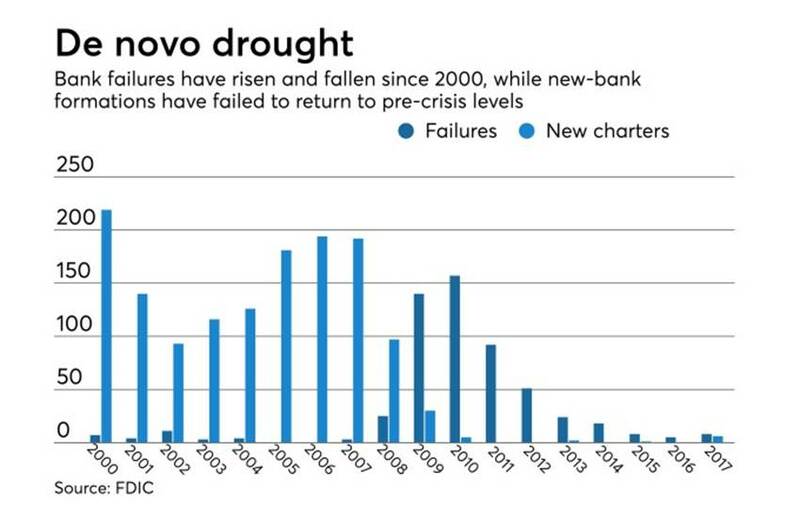 After remaining fairly steady for more than three decades, the total number of banking and thrift charters declined from around 15,160 in 1990 to 5,670 at the end of 2017. The share of industry assets held by the top 10 banking organizations rose from 19% in 1990 to 51% at the end of 2017. I do not profess to know what the right number of banks in the U.S. is, but I recognize that, like many competitive industries, a dynamic banking sector needs new startups entering the marketplace. De novo banks are a key source of new capital, talent, ideas, and ways to serve customers. Most de novos are traditional banks that offer services and products to underserved communities and fill gaps in overlooked markets. Over the past decade, de novo activity has screeched to a historic halt. As FDIC Chairman, one of my key priorities is to encourage new bank formation. The FDIC needs to do its part to make that happen. We are seeking public comment on how to improve the de novo application process, and we will engage in roundtable discussions across the country to seek feedback. We are also improving the pre-filing process to assist applicants prior to a formal submission. After years of industry consolidation, and with 14 million American adults without a bank account, we want to see more banks, not fewer. While de novo activity has historically declined immediately following economic recessions, never before has the level of new banks been so low for so long — only two new startup banks opened between the end of 2010 and the end of 2016, and just 11 have opened since the end of 2009, most in the past 18 months. To put this in perspective, prior to the financial crisis, the only time since the FDIC was established in 1933 that fewer than 20 new, insured banks opened in a single year was 1942, in the midst of World War II. De novo activity is not where it should be. While banks operate in a competitive marketplace, unlike most industries, not just anyone can start a bank. A federally insured bank needs a charter, either from the Office of the Comptroller of the Currency or from a state authority, and then needs approval from the FDIC to obtain deposit insurance. This gives the FDIC a significant gatekeeper role for firms that want to enter the banking system. With taxpayers standing behind FDIC-insured banks, we need to confirm that the bank has the appropriate capital, management, and other characteristics to ensure that it is strong enough to survive, thrive, and serve its community. At the same time, a pipeline of new banks is critical to the long-term health of the industry and communities across the country. The application process should not be overly burdensome and should not deter prospective banks from applying. The FDIC wants to see more de novo banks, and we are hard at work to make this a reality. That is why we are seeking public comment on what steps the FDIC can take to improve the deposit insurance application process. While the public comment process is underway, we are rolling out an improved application process to allow a prospective organizer to submit a draft deposit insurance proposal prior to an official submission. The FDIC will review draft proposals to identify potential issues and work with organizers so they can fine-tune applications before a formal filing. The FDIC is also launching a nationwide outreach initiative. We will hold a roundtable discussion in Washington this month, followed by discussions in each of our six regional offices in the coming months. In October, I announced the FDIC’s “Trust through Transparency” initiative, which includes a new section of our public website where we are making publicly available previously unpublished internal metrics, including processing times for de novo applications. Additionally, through our website, interested parties can request the public portion of deposit insurance applications, and view lists of pending applications and decisions on applications. We recognize that new startups can bring innovation and vibrancy to the industry. A number of fintech firms and various types of operating companies have expressed interest in becoming or establishing insured financial institutions. The FDIC is open to deposit insurance applications from such organizations. I am encouraged by innovative firms with novel ideas for expanding access to banking services and making banking more efficient and customer-friendly. As with any other filings, these firms must meet all applicable statutory factors, as well as our standards for safety and soundness, in order to be approved for deposit insurance. Establishing a new bank is a challenging endeavor. It takes time and resources to recruit a competent leadership team, raise capital, and develop a sound business plan. The FDIC stands ready to work with those who are prepared to build strong new community banks. Together, we can ensure that Mary’s future daughter can stop by her local bank to hug a teller.